Expanding the 2000 series lineup, the new 2130 Early Riser planter adds 12-row models with 30-, 36-, 38- or 40-inch row spacing, and a 16-row model with 30-inch row spacing. New convenient bulk-fill and fertilizer options for accurate, high-speed planting. 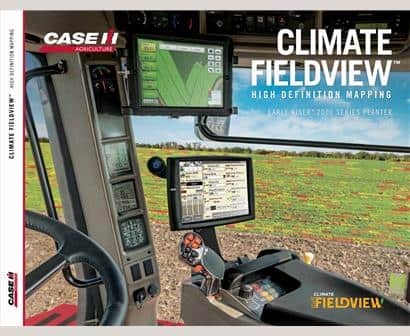 These new models enhance productivity for specialty operations, such as high-tech strip-till and furrow irrigation operations, and for specialty crops. Available as an option on the 2150 Erly Riser planter, this new 2 x 2 liquid fertilizer and row cleaner combination system mounts directly to a planting unit with no-till style floating row cleaners. The offset opener design places liquid fertilizer directly in the soil, maintaining a constant distance from each seed. Recent field testing shows our industry-leading new Early Riser planter row unit is where speed, precision and performance meet. The unit is high-speed capable while delivering accurate seed placement, net effective stand and harvest data. Sixteen inches of vertical row unit travel improves performance in varied terrain while providing greater clearance for residue managers. Cast-iron row unit is built with larger, common hardware and fewer parts. Larger diameter and thicker Earth Metal® offset opener blades are agronomically designed to slice through residue and tough soil conditions. Pulled gauge wheels with soil relief grooves eliminate sidewall compaction and control soil flow through changing ground speeds. The furrow forming point creates the industry’s only flat-bottom seed trench. Through up-or-down hydraulic pressure, automatic and row-by-row DeltaForce® achieves consistent weight on the gauge wheels for unparalleled depth control. Or select air downforce with or without in-cab gauge wheel feedback. CleanSweep® air cylinders allow for in-cab adjustments of residue manager ride to accommodate soil and residue conditions. Inverted closing disks zip the trench closed, placing high-moisture soil directly onto the seed. The press wheel ensures proper seed-to-soil contact. To achieve the perfect picket fence stand, you need a seed meter capable of delivering accurate and consistent seed singulation, populations and in-row spacing. The all-new seed meter and electric drive at the heart of the new 2000 series Early Riser planter row unit do just that. And it does it at your speed. Get an inside look at how Advanced Seed Delivery™ provides the most precise control from the meter to the furrow. Row-by-row overlap control and curve compensated spacing deliver optimal seed singulation and spacing. A simple design provides tool-free crop changes and reduces mechanical drive components. For the most accurate seed delivery and placement to and in the trench, the 2000 series ASD option includes the new SpeedTube from Precision Planting. Available for corn and soybeans, the SpeedTube™ uses a flighted belt to control the delivery of the seed from the meter to the furrow, eliminating the drop and tumble variability of traditional gravity drop tubes, especially at high speeds. Our 2000 series Early Riser planters are equipped with bulk-fill tanks to provide reliable seed delivery from the tank to the mini-hopper — no matter the seed population. The 2160, 2150 and 2140 models feature two bulk-fill tanks, and the 2130 model features one 50-bushel tank. Plus, optional 1.9-bushel, on-row individual hoppers are available on all 2130 and 2150. Extend your planting window with the Rowtrac™ Carrier System. With increased flotation over a wheeled carrier, this carrier system reduces compaction and improves yield potential in wet spring conditions. Plus, it provides better maneuverability and a smoother toolbar ride. 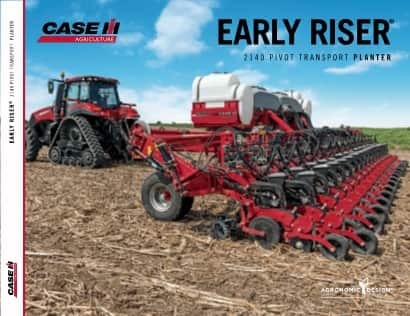 The Rowtrac Carrier System is currently available as a factory-installed option for the 2160 Early Riser planter and will be available for the 2140 Early Riser planter for spring 2019. A conversion kit for the 2140 planter will also be offered for producers who desire to convert their planter to tracks. Exclusive towed-implement track undercarriage design is pivotable on three major axes for pitch, roll and yaw movement. This system allows the tracks to uniformly minimize ground pressure, even in rolling terrain. Transport steering improves maneuverability, especially in tight field entrances. One set of track paths controls in-field traffic and reduces pinch row compaction from dual wheels. Fore-aft track oscillation provides excellent ground contact and weight distribution on undulating terrain. Side camber promotes even wear and extended track life through uneven terrain and roading. As the only planter engineered and built with Precision Planting® components, you can customize your planter with the most accurate planting technology, direct from the factory. 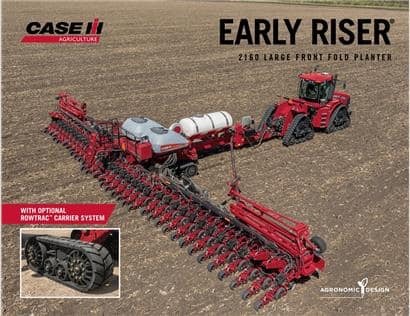 And, while others may offer some of these components, only the 2000 series Early Riser planter combines Precision Planting technology with the industry’s most agronomically designed row unit. 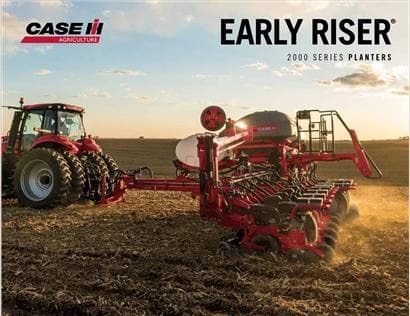 Many components of our 2000 series Early Riser planters – including the metering system and row unit settings – provide tool-free crop changes and adjustments. Plus, we’ve eliminated all the mechanical components – hex shafts, bearings, couplers, sprockets, chains and clutches – needed to turn a conventional planter. Fewer things to go wrong means reduced, simpler maintenance. Direct from the factory, each 2000 series Early Riser planter is configured to meet your specific needs and fit perfectly into your cropping practices. You can customize your planter, like never before, to your farm’s soil types, terrain, fertilizer and chemical application needs, and crop residue management preferences. A 23-, 24-, 31- or 32-row planter with 15-, 20- or 22-inch spacing with a split row configuration option that requires anywhere from 250 to 380 engine hp, based on planter size and desired speed. Available in wheeled or track carriers. A 32-row planter with 30-inch spacing or 36-row planter with 20-, 22- or 30-inch spacing — available in wheeled or tracked carriers. Toolbars ranging from 60- to 90-feet require 380 to 620 engine horsepower, depending on planter size, desired speed and terrain. A 12-row planter with 30-, 36-, 38- or 40-inch spacing , or 16-row planter with 30-inch spacing with a stack-fold configuration that requires anywhere from 180 to 310 Engine hp, based on planter size and desired speed. From new technology to maintenance guides and planting reports, the Case IH Blog is your resource for timely planting tips and information. Configure and price your new 2000 series Early Riser Planter. Customize it the way you want. 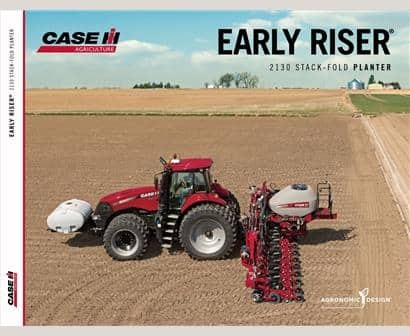 See the latest special offers from Case IH.